Did you attend the school? Did you always know you wanted to get into hair? Or was there a different path for you? I attended the Aveda Institute in Calgary in 2016, prior to hair I was in the Information Technology for 20 years. Growing up in a small city in Manitoba I was fascinated with fashion, hair and all the unique freedom the 80’s brought to hair, design, colour, style and cut. Being brought up in a traditional Italian household, the one way I found I could express my colourful personality was with hair. It was not permanent so my Mother could not get to upset with the cuts I would come home with. When I started school, I was terrified, and questioned myself everyday. I had the most amazing educator, her attention to detail, ability to support, mentor and provide me the honesty I craved to learn and accept mistakes are part of the process was with absolute love and care. I was and still am drawn to cutting. Styling and colour was something I found challenging even terrifying at times. I felt supported by the entire AIC staff, with that I requested to be booked for the two things that scared me the most, updo’s and colour. There is no safer place to challenge what is not natural to you, than in school. In that moment she made it all speak to me in terms that resonated with me. From that day on I spent my Mondays (days off) doing photoshoots for the salon I worked at. This is one example of many that made my school days successful and has kept my heart with the AIC culture. My days after school, the same support has been with me, our Creative Director has always made time for me, encouraged me, taught me, taken the time to help me focus on the big picture one step at a time. This industry is not a quick journey, not easy, however it has been with the greatest support. How did you come to hear about Aveda Institutes Canada? I’ve had many talented friends in the industry, most of whom have been apart of the Academy course, Ace, and Institute. Making the decision to finally chase my dream of becoming a stylist, I created a questionnaire and sought out to ask my talented friends a series of questions. All stood firm there was no better education than the one I would receive from Aveda. Truth be told, I already had my mind made up on attending Aveda as a dedicated consumer of their products, I love what Aveda stands for, and the hands on participation they make in improving the lives of others. Where did your story with us begin? I was first introduced to Aveda in my early 20’s, the aromas, plant based purity, had me hooked. 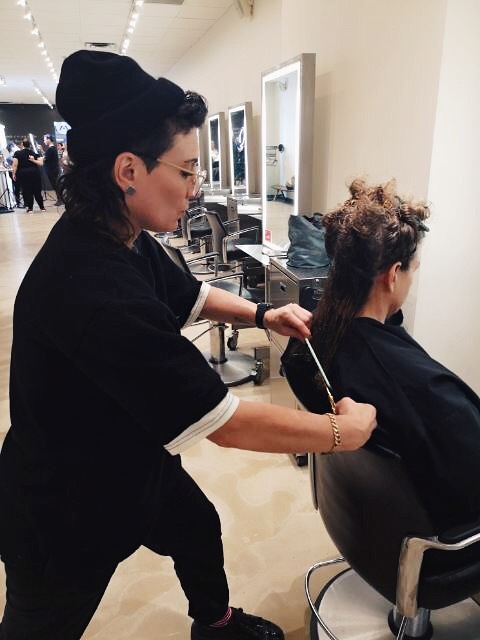 As I became more familiar with Aveda’s footprint on the environment, respect for the communities they source their products and the amazing talent of the Hairstylists, I have had in my hair, I have been an Aveda baby for 25 years. As a stylist – talk about some of your greatest accomplishments or challenges. My greatest accomplishment has been proving to myself, that I’m never to old to learn, never to proud to admit I am forever learning, and making a life changing career change, was the best decision I have ever made. My biggest challenge, achieving that perfect bob, I love precision cuts, the classics and how each cut is designed for the guests individuals lifestyle and features. What’s it like to be Lara from #aveda403? It’s energetic, focused, sassy, and entertaining. Everyday is a new day, with new challenges, and creative practice. Working in a supportive team environment inspires me, and supports me in my journey. I enter the institute everyday like a kid, eye’s wide open for the excitement of creating confidence in not only my guests, but everyone I work with. Everyday I push myself and learn form those I work with. A day in the life of Lara …. When I’m not in the salon, I am spending quality time with my Calgary family & friends, learning from the two sweetest little girls, that life is full of wonder, growth, creativity, and many new firsts. I love walking in this city, exploring the vast landscape and observing the many personalities that live here. As a transit rider my hair mind analyzes faces, hair and individual fashion. Music on, I will find one soul, and immediately my creative mind starts to vision craft. From the techniques I would use, to the editorial backdrop, to each detail of clothing. I love thriller shows, and anything to do history of our nation, and the iconic criminal minds of the past. What’s your favourite part of working at AIC? The Team, the students, the camaraderie that comes with learning, and supporting one another. This is where I started, and this is where it feels like home. Beneath my sarcastic, bold personality, is a deeply caring, analytical soul. My creative side is not only with hair and the absolute freedom of Editorial work, my passion began from abstract of clay, to drawing, and writing, both poetic and creative. I enjoy practical jokes either playing them or having them played on me, I live for the small moments, and seconds it takes to make a loving memory. My Nonna for my first years, in this hair world, Katelyn, Both are strong independent woman who care deeply, enough to provide me constructive criticism that comes from love to guide me to be the best person I can be, support and compassion when they just know I need it. Where do you see yourself in the industry in 5 years? In five years, I plan on being the crafter I am working towards today, with the dexterity, vision crafting, and technical reproduction that is required to be a Precious cut crafter. If that plan works out, I would love to be behind the scenes of NYC Fashion week, assisting the Aveda teams. Why is AVEDA so important to you? Aveda is human nature, the respect of each individual, the support and nurturing of each ingredient both plant and human form, Aveda is Love. What about being a stylist is rewarding? The one on one relationship I build with my guests. It is absolutely humbling to have a person trust you with their look, and through the years of recreating those new visions they have, there really is no greater way for someone to say, I trust you. Why did you choose this career path over more traditional ones? My love for fashion initially and the arts, there is not one human who has the same hair, facial structure, personality or vision of how they look. There is no greater palate to be creative. I need to learn, I strive to be challenged everyday, and this industry there is no shortage of these aspects. Never being boring.